Whether you pictured a cricket or correctly assumed a monitoring device when you heard the name “Bug” you couldn't be prepared for the massive impact that such a small object would have. The latest episode of Breaking Bad was perhaps the most compelling of the season with major developments on nearly every front, all handled with the usual flare that comes with one of television's best dramas. As one war was being averted, a much more personal one that has been brewing all season was reaching its tipping point. Now the relationship that has weathered carnage, destruction, and death may come to an end with one cheap GPS tracker. Breaking Bad has never been averse to puzzling cold opens, and while the series has been a little light in that regard with this season, for the second week in a row the audience was left wondering how the blood we were seeing on screen would come to be spilled. At least this time we knew who it was, thanks to Walt's stylish suede shoes matching up to the shot of him arriving to pick up Hank. And as it turned out, their trip back to Los Pollos Hermanos to retrieve Hank's tracker was engaging enough to put thoughts of the cryptic claret on the back burner. It was heartbreaking to see Hank so gung ho and optimistic when we already know his efforts would be fruitless. Seeing him try to ease Walt's nerves with that Schrader charm only made it worse. Admittedly though, the sympathy felt for Hank wasn't enough to keep a smile from cracking at his terrible rendition of “Eye of the Tiger”(you think he would have picked up some tips on singing from Gale's karaoke video). He may not have lightened Walt's mood, but Hank is always able to provide a little comic relief for the audience. Which is why it's painful to know his investigation doesn't have much chance with one of his key targets “assisting” him, and that with Walt warning Mike ahead of time, his inspection of the distribution center isn't going to turn up more than drumsticks and spotless floors. Hank wasn't the only one of Walt's family members having a rough day, and Skyler's blast from the past came with quite the bombshell. Watching her go through all the motions of faking customers did breed a little remorse, even if she did push to get exactly where she is right now. Ted, her former boss and one-night Romeo, proved his sense of timing is as bad as his skills at tax evasion by choosing that moment to let Skyler know he's being audited. Watching her veneer of the consummate professional peel off like a cheap coat of paint was a well written and performed turn for the character. Skyler isn't necessarily any more likable as a person, but her character has never been more interesting. And no, it's not just because she broke out the pushup bra to help Ted avoid jail time. Throughout the season her desire to show she's better at the drug business than Walt has provided a plot more compelling than any of her previous ones. And this new-found interest in the character should only continue as she does her best to hide the ax that may be swinging down on her and Walt's neck in the form of an IRS investigation. Especially because Skyler doesn't seem to realize that whether you're giving a mouse a cookie or a man $600k to pay off his back taxes, he's going to want more. In terms of drawing in the viewer, neither Hank or Skyler could compare with the the main plot of “Bug.” Which is no surprise, considering they were competing against a sniper and a partnership-ending brawl. Gaff(the man who ripped off the truck shipment and attended the meeting with Gus), is obviously the cartel's best man for sending a message, and though Gus likes to save face, the lone sniper got the job done with a single kill. Not that seeing Gus pull some “Terminator s***,” as Jesse put it, wasn't an impressive moment, but Gus is also smart enough not to let his bravado become hubris. He will walk freely into the line of fire, but he won't walk into a war he can avoid. Which after last week's reveal of his first encounter with the cartel, shows the true level of pragmatism within Gus. 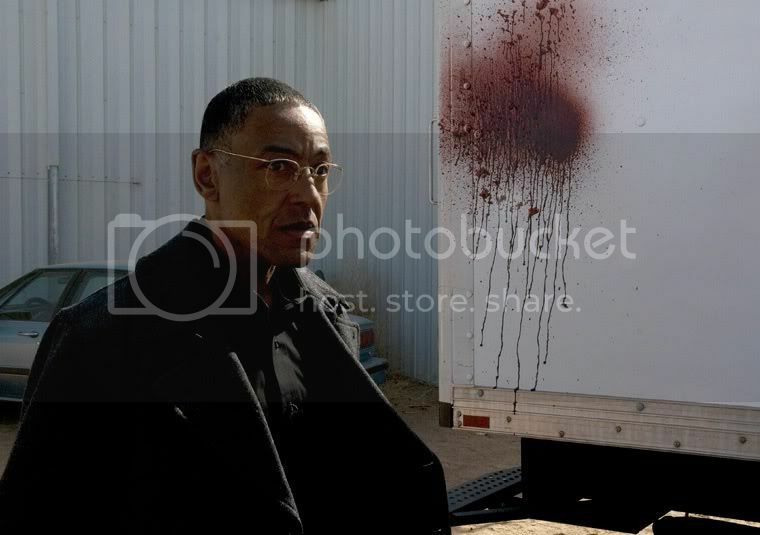 The hate and anger that has been eating at him for over twenty years still hasn't clouded his judgment, and though he wants nothing more than to refuse any demand the group responsible for his best friend's death may make, business takes precedence over bloodshed in the mind of Gustavo Fring. Now if only Walt and Jesse could learn to do the same. Though he probably won't be winning any awards for beating up Bryan Cranston, Aaron Paul gave another intense performance as he and Gus paused from breaking bad long enough to break bread together. Seeing Jesse's worst fears realized for a brief moment led to a brilliant scene between the two, with Jesse ranting and Gus responding not with his usual silent calm, but with a bristling rage of a man who isn't accustomed to being forced into anything. 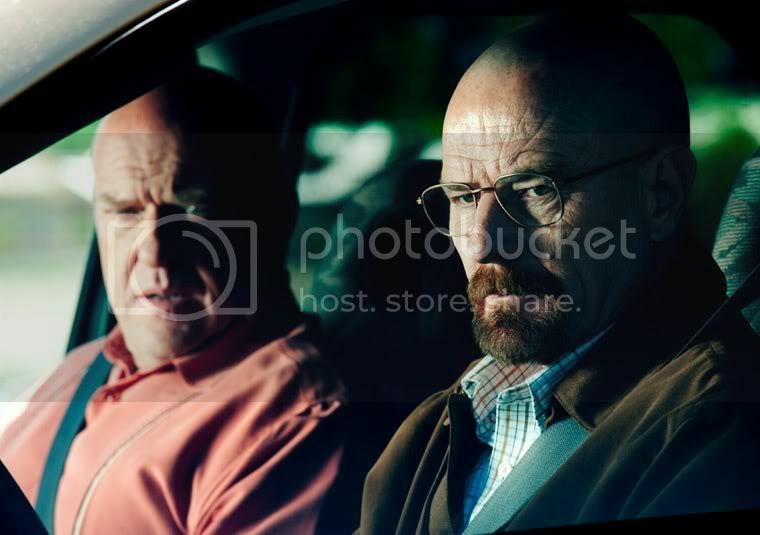 When Gus asks if Jesse can cook Walt's formula, the younger man thinks his self-centered partner was right all along: it is all about him. After finally building up his own sense of self-worth, Jesse is understandably furious in thinking Gus just sees him as a replacement lab jockey that would sellout his partner that easily. Master manipulator that he is, it can't be put past Gus to have intentionally misled Jesse, so that when he learned Gus actually needs him to prevent war with the cartel, it would have that much more effect on the budding loyalty he feels towards the Chicken Man. That dinner, and the fact that Jesse walked away from it with an unused vial of Ricin, would be the straw that broke the camel's back in his and Walt's relationship. For the first two seasons, Jesse was a constant source of frustration, as was Walt's bending over backwards to cover for him. But as the series progressed to where it is now, the two have ended up on even ground for the things they've done to each other, and more importantly, for each other. Now it's hard to lay blame solely on either of them. Jesse may be forgetting who his friends are, but Walt is forgetting who his enemies are as well. The brawl resulting from Jesse not poisoning Gus when he had the chance, and then asking for Walt's coaching so he can teach cartel kids the formula, was just as much on Walt for bugging Jesse's car after he all but demanded Jesse kill Gus, without regard for the effect Gale's death has had on him. Neither of these men have a future in the UFC, but it was the vehemence behind their uncoordinated blows, rather than the fight itself that gave the scene so much impact. They may not have been able to count on each other as completely as they would have liked, but the dissolving of Walt and Jesse's alliance means they are both completely on their own at a time when they need each other more than ever. Even without the major development the ending of “Bug” brought, it was already brimming with so much brilliant acting and powerfully written drama that it would still have placed highly among the other episodes of Breaking Bad's fourth season. And with only four episodes left, the high-strung atmosphere that “Bug” provided is only going to intensify as the season draws closer to its climax.